It shouldn’t be surprising that a certain mystique has grown up around Aaron Cometbus. As a writer who seldom subjects himself to interviews (one of the few can be read here) and never does public appearances to promote his work, he’s more or less invited his readers to project their own fantasies onto him. Two of the most prevalent myths or legends they’ve come up with involve his being a) a nomadic über-punk who lives out of dumpsters, never bathes, and subsists on a diet of black coffee and day-old vegan donuts; and b) the Kerouac of his generation. The fact that many of you reading this will have barely heard of him is testimony more to his low-key way of going about things than to the quality of his work; in fact someone wishing to write the definitive text on How Not To Become A Famous Author could do worse than study the three-decades-long career of Mr. Cometbus. Like the punk band that shows no interest in signing a major label record deal, and, without even having to say so, manages to give the impression that they wouldn’t be interested if you offered it to them on a plate, Aaron continues to be the virtual embodiment of the DIY ethos and aesthetic. Although in recent years he’s relented somewhat on a couple fronts – he no longer hand-letters his work, and has allowed indie outfit Last Gasp to distribute some of his books and magazines – he still personally oversees nearly every aspect of publication, including driving – being driven, I should say; he’s never had a driver’s license – to the printer to pick up the newly minted copies, packing them into boxes for shipping, and personally walking into most of the book and record shops in New York City to supply them with his latest issue. Oh, and about the Kerouac thing: as one of those who was guilty of hanging the label on him in the first place, I feel I need to set the record straight: it’s glib, facile, inaccurate, and probably disrespectful to both writers. That’s not to deny that there’s a certain commonality: both Cometbus and Kerouac can be seen as speaking, if not for their respective generations, certainly for the most vital subcultures that each of those generations produced. The other obvious similarity is that both writers became known early on as expositors of the traveling life. But as Aaron has pointed out, only a handful of his works deal specifically with travel; others, especially the more recent ones, focus on what it’s like to find a place and live there, to become part of it, to fall in love with it and probably have your heart broken by it. One of Aaron’s longest-running love-hate affairs has been with his hometown of Berkeley, California. As he was coming of age, right at the time when kids, drawn by the emerging Gilman Street scene, were flocking to the East Bay from around the country, he couldn’t stop thinking about getting the hell out. An opportunity to do so came with the legendary first (and, I’m pretty sure, only) Crimpshrine tour; half the band bailed out after six shows and retreated, with the van, to California. Left by the side of the road with his guitarist and what the two of them could carry, they recruited a new bassist and finished the tour in his Ford Pinto. Another opportunity came in the summer of 1990, when Aaron hopped in the van with Green Day for their first national tour. He continued to travel with them for the next few years, during that crucial time when they began the metamorphosis from goofy kids with some catchy tunes to biggest band in the world. Although he functioned on these tours as roadie and merch guy, confidant and adviser, none of these roles obscured his primary relationship to the band, that of friend. And while the humble van (and later, Bookmobile) gave way to fleets of semi-trucks, and the one-man road crew was replaced by a staff numbering in the dozens, the friendship endured. Not without its rocky spells and interruptions, as In China With Green Day, aka Cometbus 54, makes clear, and in that sense, it resembles the way Aaron has repeatedly left Berkeley, only to return and re-examine it in the light of greater experience and compassion. Whoa. Clearly this is not the Cometbus of popular song and story; no dumpster-diving or hardscrabble doomed misadventures on the fringe of the punk rock ghetto here. Green Day had invited their old friend (and, in the case of Billie Joe Armstrong, Jason White, and Bill Schneider, their occasional bandmate in Pinhead Gunpowder) to travel with them during a two-week tour of Asia. During that time he would fly in the same planes, sleep in the same hotels, enjoy the same hospitality and social interactions as members of the band. It’s the kind of access that most rock journalists could only dream of, but Aaron, while he’s occasionally written about bands or music, is no rock journalist nor did he have any intention of becoming one. So while you get some insight into what it’s like backstage at a giant stadium tour, he directs most of his observations toward a) the cities they visit along the way; and b) the evolving nature of his relationship with his longtime friends. When questioned about it, Aaron would sometimes smile enigmatically, and other times point out through slightly gritted teeth that while fiction might draw on real people and events for its inspiration, it remained just that: fiction. 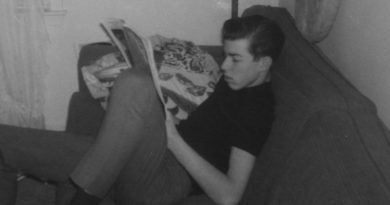 At the same time, both his fiction and nonfiction were often burnished with a sort of starry-eyed optimism and romance – and the burnt-out disgust and cynicism that are frequently their flipside – that had great appeal for readers but sometimes left them wondering just how real the world he described ultimately was. In his most recent work he’s made great strides toward squaring that particular circle. 2009’s The Spirit Of St. Louis explored familiar themes but featured characters and settings that were entirely fictional (or were they? one correspondent claims that they were merely transported from Pensacola to the Midwest) yet paradoxically rang truer to life than the semi-fictional or thinly veiled real components of previous Cometbus stories. In China With Green Day breaks new ground for Aaron while representing a culmination of what he’s been working toward all along, perhaps without even being aware of it. It’s a punk rock adventure, romance, yes, even love story, consisting completely of real people, places and events. And, unlike his work heretofore, Aaron drops the masks, disguises and subterfuges that left him as little more than a marginal presence in his own stories, instead putting himself at the center of the narrative and subjecting himself to the same relentless yet compassionate examination he has traditionally reserved for others. It makes for riveting reading, and while Green Day fans will no doubt devour every detail, you needn’t be familiar with the band to enjoy this book. If you’ve somehow managed to live through the past 23 years without hearing their music or forming an opinion about Green Day, I’d be surprised if, having read this story, you didn’t become interested in checking them out, but either way, it doesn’t matter: the real theme here is not rock stardom or fame or fortune, nor is it travel and adventure in far-flung foreign lands. Instead, it’s about friendship, and community, and shared culture: how they change, how they evolve, and ultimately, how they endure. The timeless Cometbus tropes and motifs, you might say, but raised to a whole new level. It’s the kind of writing he’s been getting ready to do his whole life, and now he’s gone and done it. Pingback:kendrak's attack » I used to be “eerie, lost-looking” but I hope I’m better now. That was a great read, Larry. I got to tell you, Green Day’s relationship with the East Bay punk scene post Warner Bros. has always been something that intrigued me. So many people/media outlets have painted such a humiliating picture of Green Day as if they themselves were part of that “scene”. When in fact, they were not and Green Day was. How can Green Day take the heat they do and an outfit like Blink 182 was never really ridiculed for their punk rock “image”. If Green Day left Lookout! to accomplish one radio hit, maybe they did leave something better behind; but I think history has shown they were right when they thought their musical potential deserved a bigger audience. So I guess it sometimes bothers me that their past and future can’t see eye to eye when both have such importance. I sometimes liken it to Paul and John’s relationship after the Beatles split, how could two such gifted artists not be able to see past their difference and realize just how important each was to other? Thanks, and your thoughts? 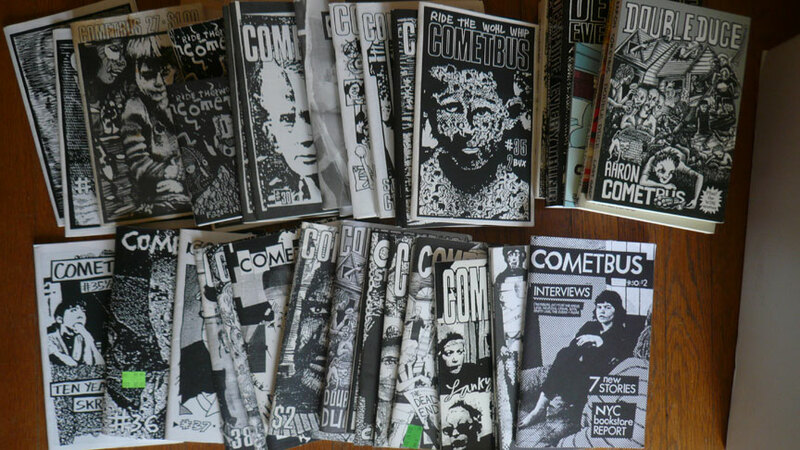 This was the first issue of Cometbus that I had ever read, although, being a huge Green Day fan, I had heard of it before. I absolutely adored this zine/book/story. Also, Larry Livermore, you have kind of been my hero ever since I read your article in Hit List many years ago. Just found this via google. I met Aaron once – I was travelling around the US, visiting from England in the mid 80’s and washed up in San Francisco with no place to stay. I headed to Berkely hoping to find a squat or a student house or a friendly floor before I flew back to the East coast and on home. I didn’t know a soul but I saw a vaguely punky looking guy and ask him if he knew of anywhere. He put me in touch with a friend, a girl called Katja, and I stayed at her place for a while. He was a nice guy and he really helped me out of a hole. We went out to eat a couple of times and hang out, I fell a little in love with Kaja, learned to ride a skateboard.. and then it was time to leave. Sadly, while in New York on the to the airport I was robbed and lost the most important things a traveller has in his posession – my passport, my camera and my address book. I always remember his name because it was so unusual.. Aaron Cometbook, he had a fanzine. Google is a wonderful thing. Please give him my love when you next see him. I think the irony of it all is that what these rabid fans are ‘competing’ for is really not worth competing for at all. Don’t get me wrong now, I mean, Green Day is a great band and all. I’ve been listening to them consistently for almost two decades now, and will probably be listening to them in the years just before I’m ready to check out of this life. But so many Green Day fans act as though they’re young men jockeying to enter Plato’s Academy, or budding stage actors trying to rub shoulders with Shakespeare’s drama circle. While Green Day and the whole Gilman/East Bay thing was a welcome reprieve from the corporate bubble of that era, it was/is not nearly as important as many people (you yourself) seem to think it was. In the grand scheme of things, it will be forgotten relatively quickly once those who were around for it die out. I know that sounds depressing, but it’s just the reality. The same soulless corporate environment of the latter part of the twentieth century that made it possible for something like East Bay Punk to be a breath of fresh air for so many of us has warped our sensibilities and ratcheted down our intellectual standards to the point where many of us are misled to think that stuff that really only ranks a “3” or so on the historical cultural and ideological Richter scale actually ranks much, much higher. People need to keep things in perspective. Learn some history. A rock band is not on the same level of cultural or historical importance as Bach. The New York ‘intellectual’ scene is schlock compared with Greek and German philosophy. Williamsburg art galleries are a kindergartener’s fingerpainting compared with the Sistine Chapel. Yes, I know that in the ‘progressive liberal’ mind (which much of your brand of punk is derived from) everything is relative, and an African sitting in the middle of the Ugandan jungle beating a drum is no better or worse than Perlman playing the Chaconne, but in reality some things ARE better than others. And the best go on to be immortal. People need to keep things in perspective. Learn history. Btw, the Richterscale is used for earthquakes, not history importance, just sayin. P.s. What I wrote is just my way to look at it everything has it’s own importance and doesn’t need a scale to rate it. Hey, Larry! My name is Maks, i’m from Moscow, Russia. I’m doing a webzine Sadwave (http://sadwave.com/), and I’m a big fan of yours, Aaron Cometbus’s and George Tabb’s writings. My friends and I will come to NY in the beginning of October and we want to make a movie about all our ‘heroes”. We want to talk to you, Aaron and George and make a film about it. Video interviews with subtitles translated into Russian. Is it possible to meet you and Aaron somewhere in NY on these days? I don’t know (and maybe nobody knows) how to get in touch with Aaron, so could you ask him about it or just give me his email or something? last year we were visiting George Tabb, but unfortunately didn’t have a good camera back then.